Our Abpromise guarantee covers the use of ab6508 in the following tested applications. ICC/IF: Use at an assay dependent dilution (PMID 18701599). Herpes simplex virus 1 and 2 (HSV-1 and HSV-2) are two species of the herpes virus family, Herpesviridae, which cause infections in humans. They are also called Human Herpes Virus 1 and 2 (HHV-1 and HHV-2) and are neurotropic and neuroinvasive viruses; they enter and hide in the human nervous system, accounting for their durability in the human body. 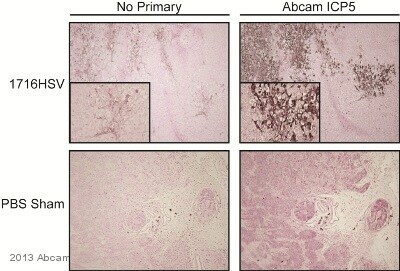 ab6508 staining HSV1 + HSV2 ICP5 Major Capsid Protein in Human head and neck cancer tissue and Mouse xenograft tissue sections by Immunohistochemistry (IHC-P - paraformaldehyde-fixed, paraffin-embedded sections). Tissue was fixed with formaldehyde and blocked for 1 hour at 23°C; antigen retrieval was by heat mediation in a 10mM sodium citrate, pH6. Samples were incubated with primary antibody (1/100 in blocking buffer) for 1 hour at 4°C. A Biotin-conjugated anti-mouse IgG polyclonal (1/250) was used as the secondary antibody. Immunofluorescence analysis of HSV infected cells, 7 hours (left) or 17 hours (right) post-infection, staining HSV1 + HSV2 ICP5 Major Capsid Protein with ab6508 at 1/200 dilution. Cells were fixed for 10 min in paraformaldehyde, permeabilized in 0.1% Triton X-100 and blocked in 4% goat serum, 1% bovine serum albumin, before incubating with primary antibody for 30 min at room temperature. An AlexaFluor®647-conjugated goat anti-mouse IgG1 was used as the secondary antibody. Publishing research using ab6508? Please let us know so that we can cite the reference in this datasheet.